Lactated Ringers Solution (LRS) - Always check expiration date! These instructions are for veterinarians, techs, and supplemental instructions for owners that have had this demonstrated to them at their veterinary office. Place 18g needle on end of syringe. Carefully remove needle cap. Draw up amount of LRS needed (see AMOUNT below) plus about one ml. Remove any bubbles by angling syringe and plunging out gently (the extra ml gives you some leeway here). If the room temp is cool, place syringe and needle in a cup of hot water for a couple of minutes (length depends on volume in syringe). Test temperature on your wrist. It should NOT feel hot, but WARM. Cap and remove 18g needle (can be used a couple of times if you place back in the cover and keep clean). Remove screw-off end of butterfly (opposite of needle end). Place this connection directly over needle firmly. 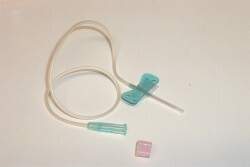 Remove needle cover and GENTLY apply pressure to syringe plunger to assure LRS is flowing. Pinch skin behind neck or at flank of rat. 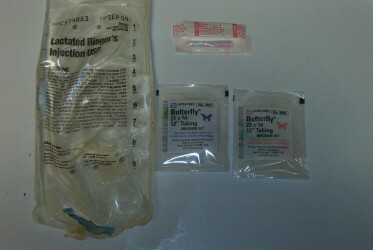 Pinch the "wings" of the butterfly for insertion. (Note: top of plastic butterfly has writing, such as gauge.) Pull up skin, and GENTLY insert needle under skin, but NOT through both sides of pinch. You will feel when needle has entered skin. Put gentle pressure on plunger of syringe. Let the rat walk about a small area such as a chair or couch and follow with the syringe (they seem more comfortable this way). When a ball forms under skin, you will need to remove the needle. 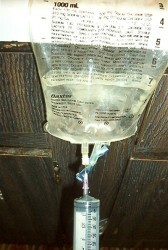 It is sometimes necessary to hydrate at more than one site on a rat to get a full day's requirement of fluid. Before removing needle, gently pinch insertion site and pull up the skin to prevent leakage. Jostle pinched skin lightly to try to disperse some fluid and prevent fluid loss. Repeat as necessary to fully hydrate (balancing is helpful - behind right neck, then left flank). Butterfly can be used for 2-3 sessions (on the SAME RAT ONLY!!!) if properly sheathed and protected, and if needle does not become dull, making it more difficult to puncture skin. 100ml/kg PER DAY. If your rat weighs 430g, she would need 43ml of fluid. This would be the maintenance amount for a FULL DAY. If your rat is only mildly dehydrated, you may try half this amount (you can always do it again later in the day). Note: Dehydration can be very dangerous in rats. It causes lethargy, anorexia, reduced urination/concentrated urine. Individual cases vary - heart disease, pneumonia, and other diseases may cause edema which can be AGGRAVATED by administering fluids. Consult your veterinarian on each case before fluid administration.